As part of the recent series of trajectories around Comet 67P/C-G, Rosetta passed within about 14 km of the comet’s surface on Saturday. 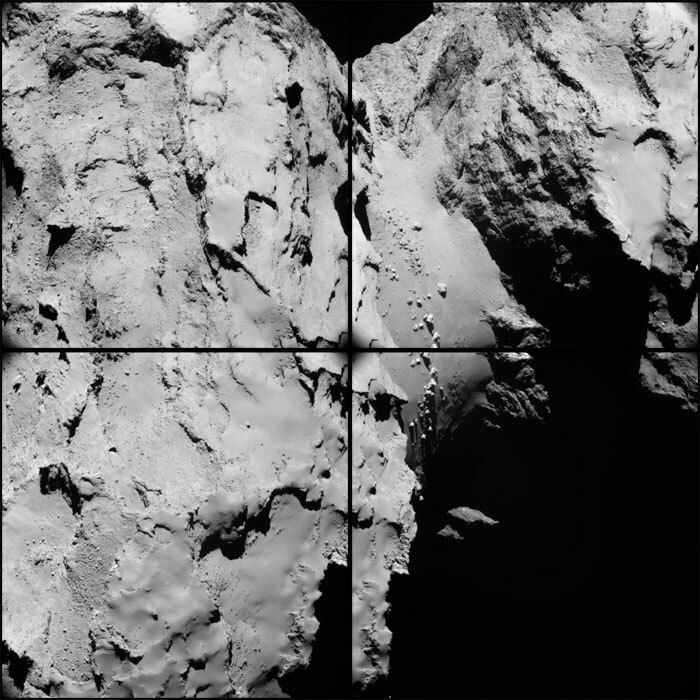 Despite operational difficulties encountered during the flyby, Rosetta’s NAVCAM was able to acquire images on the way in to and shortly after closest approach. The approach images were acquired between 09:33 and 09:51 UT, and show an oblique view across the Imhotep region. This provides the focus for the two-image mosaic presented above, which has been cropped and rotated to highlight the impressive scenery. Focusing on the 2x2 montage in its original orientation (below), the scene captures the boundary between Imhotep and Ash to the left. The cliffs of Hathor on the small lobe are visible in the background at the far left. Note that the top-right frame also includes the region that was imaged during the 14 February flyby at 6 km. The second set of images, presented below, was acquired between 14:35 and 14:53 UT, not long after the closest approach at 13:04 UT. In the same frame, further details in the cliffs of Hathor can be seen, leading up to the ‘head’ of the comet’s small lobe. The smooth region towards the right of this frame shows the transition between this smooth, presumably dust-covered portion, and the layered, exposed cliffs below. Note that the montages have been tweaked in Lightroom for global intensity/contrast, but there have not been any local adjustments made of e.g. ghosts/vignetting or other local intensity mismatches. The four original 1024 x 1024 frames from the two image sets are provided below. CometWatch will take a short break over the Easter weekend and will be back next Wednesday with a new view of Comet 67P/C-G.
CometWatch is back with two images, to offer a taste of Rosetta's trajectory in the past couple of weeks. The first of today's entries is a 2x2 montage of NAVCAM images obtained on Saturday 28 March from a distance of 31.3 km from the centre of Comet 67P/Churyumov-Gerasimenko. These images were taken as Rosetta departed from the comet, almost seven hours after its close flyby 14 km from the surface of 67P/C-G.
Today's second CometWatch entry was taken on the following day, Thursday 2 April, at a distance of about 385 from the comet's centre. The image is part of a 2x2 raster of four NAVCAM frames. Out of the four images, this one contains most of the comet's nucleus, while at the same time providing an astonishing view of the comet's activity, with jets of diffuse material extending diagonally across the frame. In this orientation, the comet's small lobe is also in the foreground, with Hatmehit well in sight. Part of the large lobe is visible in the background. Auch wenn Orbiter Rosetta nach Schwierigkeiten mit den Sternsensoren und somit der Navigation am 28. 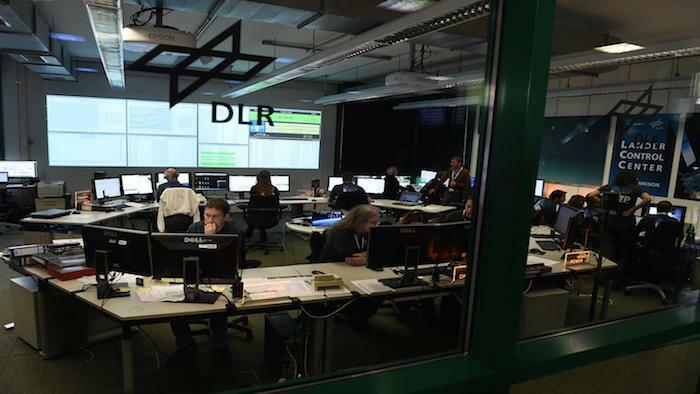 März 2015 zunächst einmal neue und weiter entfernte Flugbahnen an Komet Churyumov-Gerasimenko fliegt - das Team des "Lander Control Center" des Deutschen Zentrums für Luft- und Raumfahrt (DLR) wird ab 12. April 2015, 2 Uhr mitteleuropäischer Zeit, erneut auf Signale von Lander Philae lauschen. "Die Kommunikationseinheit am Orbiter wird dann rund um die Uhr eingeschaltet sein", sagt Dr. Stephan Ulamec, DLR-Wissenschaftler und Philae-Projektleiter. Wann genau die Bedingungen für die automatische Kontaktaufnahme zu Philae günstig sind, wird exakt berechnet, sobald die neuen Flugbahnen des Orbiters feststehen. "Am wahrscheinlichsten ist es zwar, dass Philae erst im Mai oder Juni aufwacht - allerdings wollen wir sein Aufwachen natürlich nicht verpassen, falls er bereits jetzt genügend Energie und eine ausreichend hohe Betriebstemperatur haben sollte." 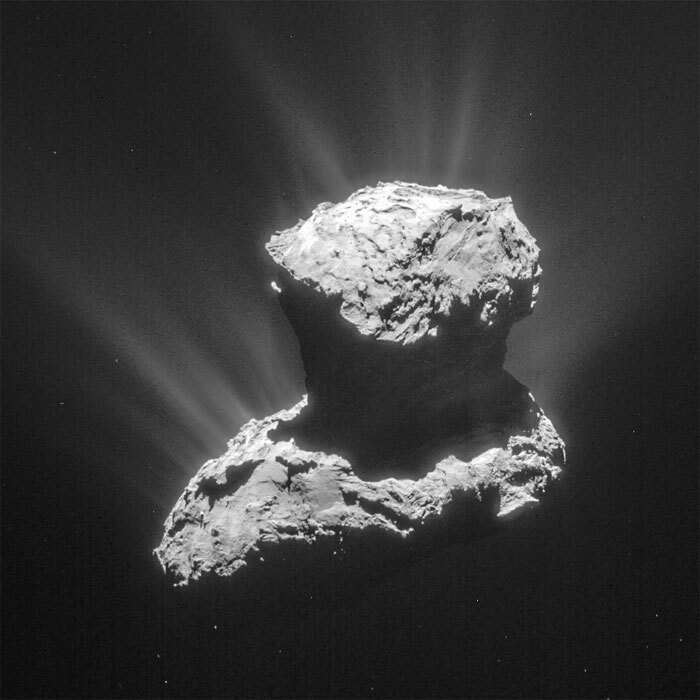 In a recent paper published in the Astrophysical Journal Letters, the GIADA team present their findings on the properties of dust particles from Comet 67P/Churyumov-Gerasimenko. This blog post has been prepared with inputs from lead author Marco Fulle, and GIADA principal investigator Alessandra Rotundi. 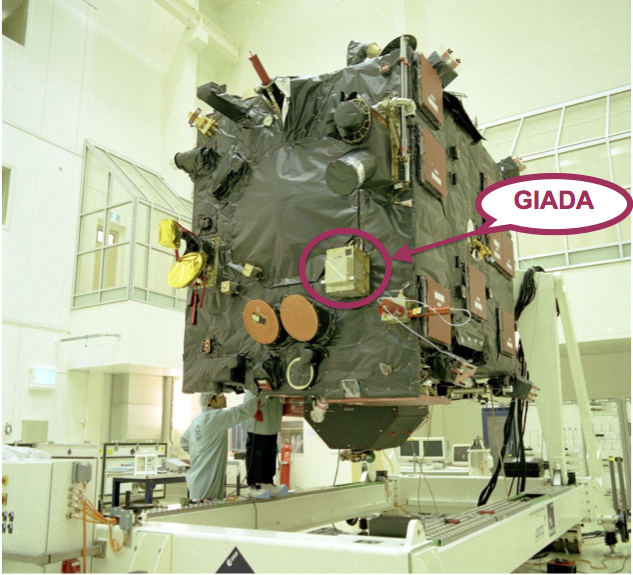 The location of GIADA marked on the Rosetta spacecraft. GIADA, the Grain Impact Analyser and Dust Accumulator, is designed to capture dust particles in the coma of Comet 67P/Churyumov–Gerasimenko as Rosetta flies around it. The characteristic properties of the dust grains can be used to infer the history of the material being ejected from comet. The latest study focuses on the dust particles collected between 1 August 2014 and 14 January 2015. The GIADA team find that the dust particles impacting on their detectors can be separated into two families: ‘compact’ particles with sizes in the range 0.03–1 mm, and somewhat larger ‘fluffy aggregates’ with sizes between 0.2 and 2.5 mm. The individual compact particles have a bulk density of 800–3000 kg/m3, consistent with a variety of minerals or mixtures of minerals. On the other hand, the larger aggregates are made up of many sub-micron sized grains with void spaces in between, resulting in fluffy, highly porous structures that are mostly empty space. These aggregates are associated with the fluffy particles seen by Rosetta’s COSIMA instrument. Indeed, the fluffy particles have effective densities of less than 1 kg/m3, literally lighter than air (at sea-level), and which Marco likens to the equivalent density of a dandelion seed head in a vacuum. During the study period, a total of 193 compact particles were detected, impacting the GIADA detectors at an average speed of 3 m/s. A total of 853 detections of fluffy particles were made, the great majority associated with 45 dust ‘showers’. Roughly 2–3 of these showers were seen by GIADA each week, lasting anywhere between 0.1 to 30 seconds. A typical shower might be broken up into a handful of sub-showers as well, lasting from 10 milliseconds up to a second. While more fluffy particles were detected than compact ones, their size distribution reveals that they only contribute a minor fraction of the total mass of dust being lost by the comet. Also, importantly, most of the fluffy particles were detected hitting GIADA at less than 1 m/s. Because the escape speed of both types of dust particles from the surface of Comet 67P/C-G should be the same, the fluffy aggregates must be decelerated somehow. The scientists believe that this is happening due to Rosetta itself. Measurements made by Rosetta’s RPC-LAP instrument show that the spacecraft is negatively charged at between –5 and –10 volts due to a variety of effects associated with the plasma environment of the comet and with solar UV photons hitting the spacecraft. This negative potential acts to decelerate approaching dust particles, which are also negatively charged. Marco explains: “Both the spacecraft and the dust particles are negatively charged, so there is a repulsive force between them. The amount of deceleration experienced by any particle is related to its charge and mass, with the maximum amount of charge held by the dust particle determined by its geometry. “For example, the fluffy aggregates can collect about 20 times more charge than compact particles of equivalent radius. These fluffy particles will be slowed down more, and could even be stopped or repelled by the spacecraft if their charge-to-mass ratio is large enough. Thus, the denser compact particles are not greatly impacted by this effect, while the fluffy aggregates are slowed down and disrupted creating the showers and sub-showers seen by GIADA. The smaller fragments arrive at the spacecraft at speeds as low as a few centimetres per second and may further collapse into rubble piles, as seen in the COSIMA images. Density is a critical parameter differentiating these two families of particles, and it is likely that they have quite different histories. By comparing the GIADA results with laboratory measurements, the scientists believe that the denser compact grains represent materials that underwent significant processing in the environment surrounding the new born Sun, before being accreted by Comet 67P/C-G as it formed in the outer Solar System. The low-density fluffy particles, however, are thought to be primitive material linked to interstellar dust, material that pre-dates the birth of the Sun and escaped any processing before being accreted by the comet during its formation. Rosetta continues to recover well from the problems experienced during the close flyby over the weekend of 28 March that resulted in the spacecraft entering safe mode. Some of the science instruments are now switched back on again, and more will follow in the coming week. 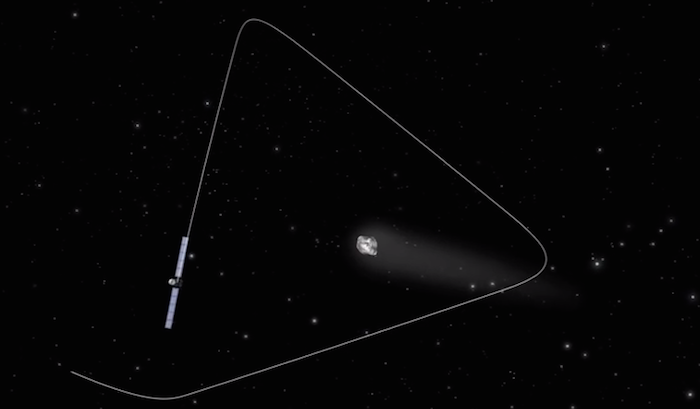 As a result of the safe mode, Rosetta moved onto an ‘escape trajectory’ taking it approximately 400 km from Comet 67P/C-G. An orbital correction manoeuvre was executed on 1 April to start to bring the spacecraft back again, and with a second manoeuvre executed on 4 April, the target distance of 140 km was reached on 8 April. But the previous difficulties in navigation mean that the operations team needs to be cautious while bringing the spacecraft even closer. In particular, they will need to assess the behaviour of the spacecraft’s star trackers in the environment of the increasingly active comet, since the previous navigation issues resulted from the star trackers becoming confused by comet particles. 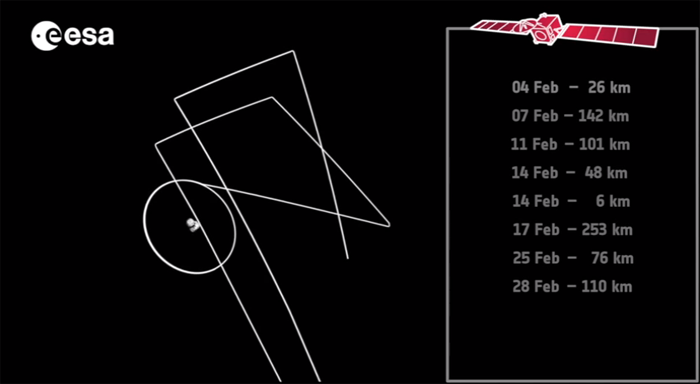 Three of these pyramid trajectories are currently planned up until the end of April. The team will assess the situation each week before deciding to move closer or, if necessary, to move further away again. We’ll provide details of future trajectory plans and the status of the science operations when this information is available. 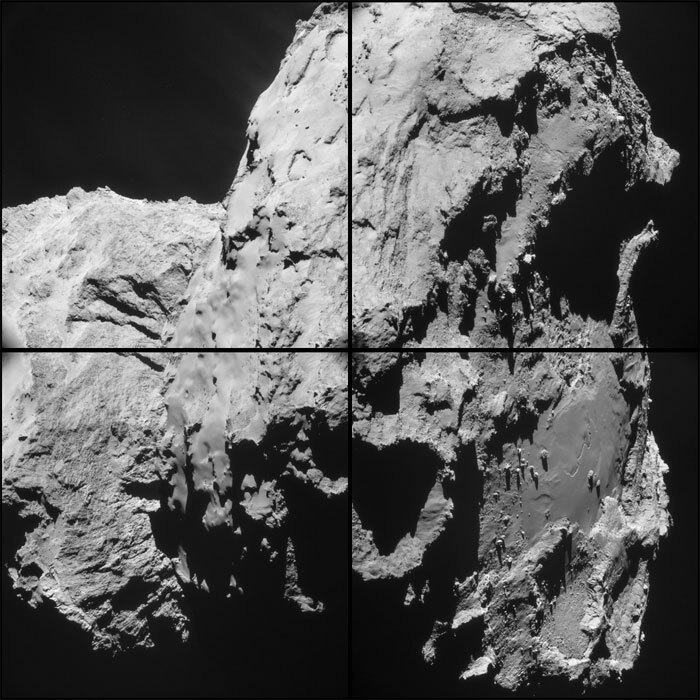 Today's CometWatch entry is a mosaic of four NAVCAM images obtained last Wednesday, 8 April, from an average distance of 137 km from the centre of Comet 67P/Churyumov-Gerasimenko. The image resolution is 11.7 m/pixel and the individual 1024 x 1024 frames measure about 12 km across. The mosaic has been slightly cropped, and it measures 9.3 x 9.3 km. 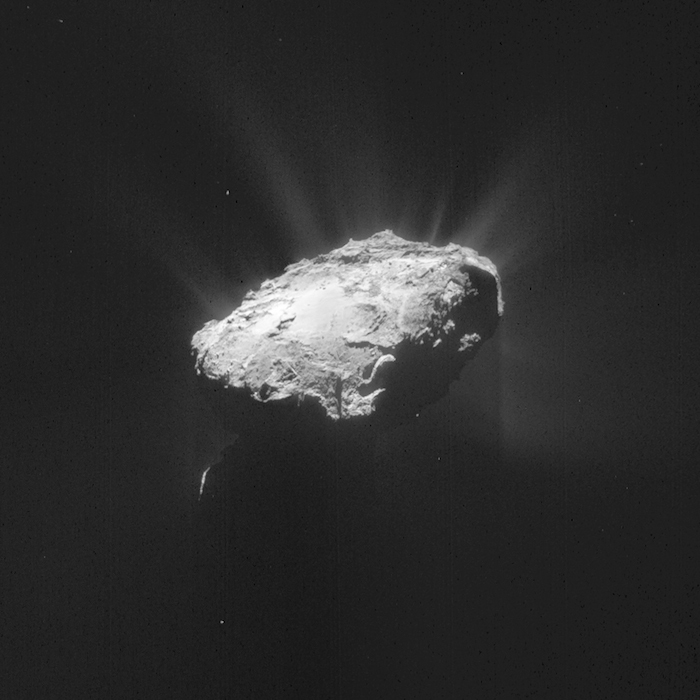 The view shows the 'underside' of the comet large lobe, revealing the smooth Imhotep region, which is covered in dust and boulders but also exhibits circular pits and other interesting surface features. 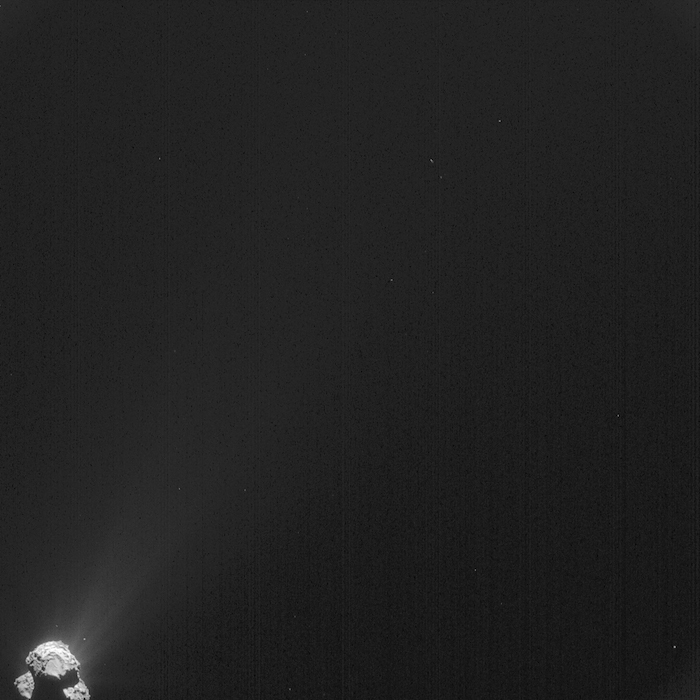 The image has been processed in Lightroom to bring out the comet's overall activity, and the bulk of the comet nucleus can be seen as a dark silhouette against the diffuse 'atmosphere' of 67P/C-G, below the illuminated portion of surface. A glint of the small comet lobe is also visible in the lower left part of the image. Four months from today, on 13 August, Comet 67P/Churyumov-Gerasimenko will reach perihelion – a moment that defines its closest point to the Sun along its orbit. For 67P/Churyumov-Gerasimenko, this takes place at a distance of about 185 million km from the Sun, between the orbits of Earth and Mars. Rosetta is along for the ride, and has been watching the gradual evolution of the comet since arriving in August 2014. 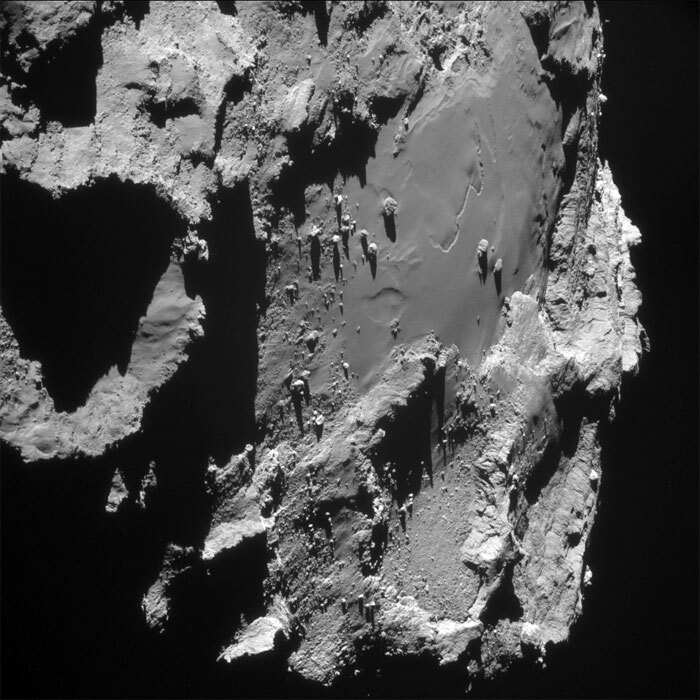 As the comet’s surface layers are gently warmed, frozen ices sublimate. The escaping gas carries streams of dust out into space, and together these slowly expand to create the comet’s fuzzy atmosphere, or coma. As the comet continues to move closer to the Sun, the warming continues and activity rises, and pressure from the solar wind causes some of the materials to stream out into long tails, one made of gas, the other of dust. The comet’s coma will eventually span tens of thousands of kilometres, while the tails may extend hundreds of thousands of kilometres, and both will be visible through large telescopes on Earth. But it is Rosetta’s close study of the comet, from just a few tens of kilometres above its surface, which enables the source of the comet’s activity to be studied in great detail, providing context to the more distant ground-based observations. 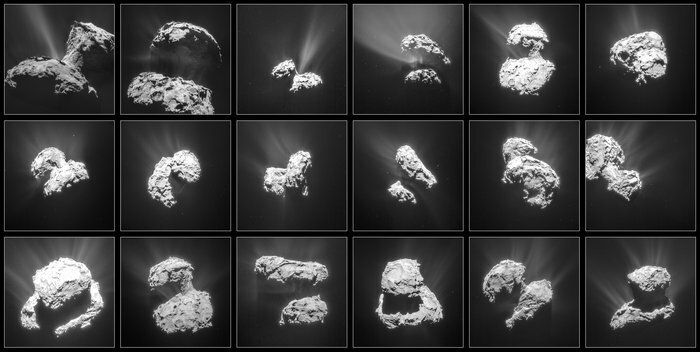 This spectacular montage of 18 images shows off the comet’s activity from many different angles as seen between 31 January (top left) and 25 March (bottom right), when the spacecraft was at distances of about 30 to 100 km from the comet. 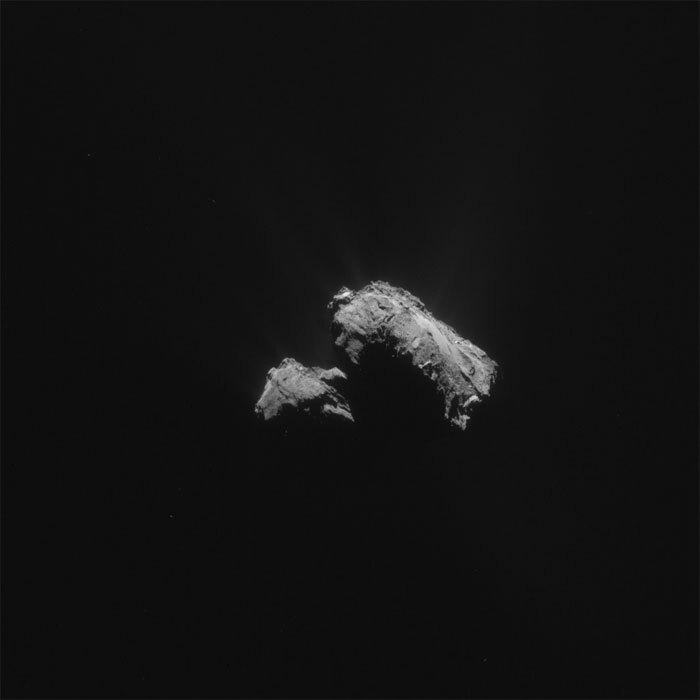 At the same time, Comet 67P/Churyumov-Gerasimenko was at distances between 363 million and 300 million km from the Sun. After perihelion, Rosetta will continue to follow the comet, watching how the activity subsides as it moves away from the Sun and back to the outer Solar System again. The images cover the time period between 31 January (top left) and 25 March (bottom right), when the spacecraft was at distances of about 30 to 100 km from the comet. 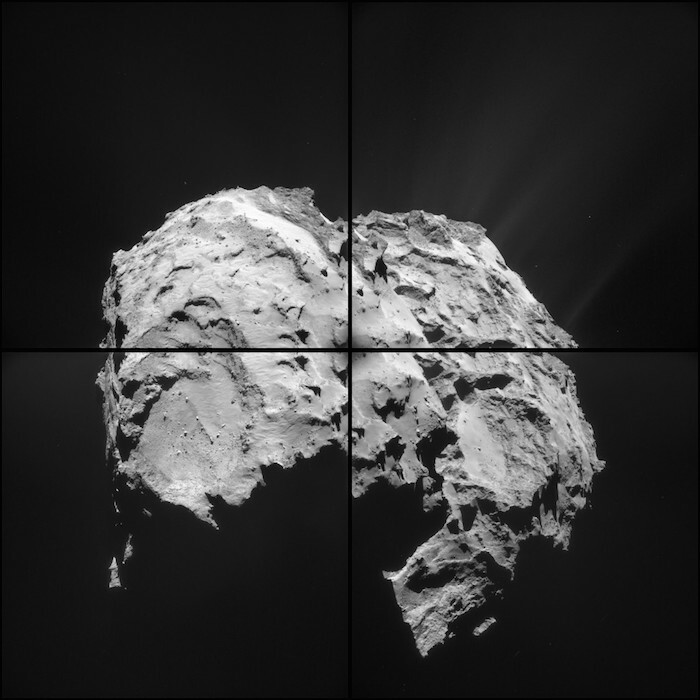 The final frame is also presented as today's CometWatch. 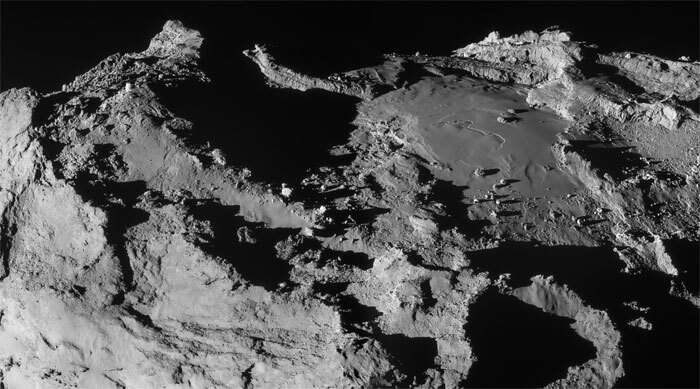 This image, acquired by Rosetta’s NAVCAM on 25 March, was taken from a distance of 86.6 km from the centre of the comet. The image resolution is 7.4 m/pixel and the 1024 x 1024 pixel image measures 7.6 km across. A processed version is presented above that emphasizes the outflowing material while also maintaining details of the nucleus. This version is also cropped to measure 6.9 km across. As with recent similar views of the comet in this orientation, we are now seeing more of the comet’s smaller lobe that was previously in shadow, revealing more details of its fascinating surface features. 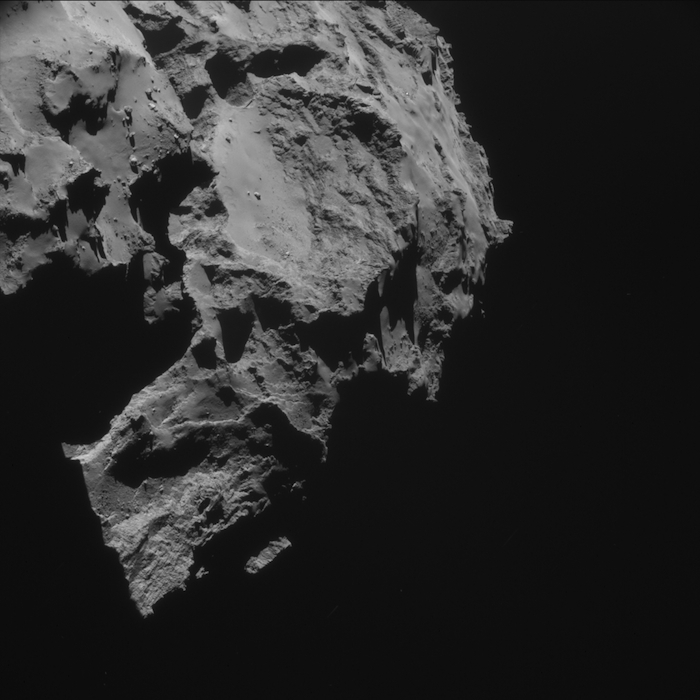 Meanwhile, the comet’s activity also continues to impress. The original 1024 x 1024 pixel frame for the 25 March image is provided below. Measurements made by Rosetta and Philae during the probe’s multiple landings on Comet 67P/Churyumov-Gerasimenko show that the comet’s nucleus is not magnetised. Studying the properties of a comet can provide clues to the role that magnetic fields played in the formation of Solar System bodies almost 4.6 billion years ago. The infant Solar System was once nothing more than a swirling disc of gas and dust but, within a few million years, the Sun burst into life in the centre of this turbulent disc, with the leftover material going into forming the asteroids, comets, moons and planets. The dust contained an appreciable fraction of iron, some of it in the form of magnetite. Indeed, millimetre-sized grains of magnetic materials have been found in meteorites, indicating their presence in the early Solar System. This leads scientists to believe that magnetic fields threading through the proto-planetary disc could have played an important role in moving material around as it started to clump together to form larger bodies. But it remains unclear as to how crucial magnetic fields were later on in this accretion process, as the building blocks grew to centimetres, metres and then tens of metres across, before gravity started to dominate when they grew to hundreds of metres and kilometres in scale. Some theories concerning the aggregation of magnetic and non-magnetic dust particles show that the resulting bigger objects could also remain magnetised, allowing them to also be influenced by the magnetic fields of the proto-planetary disc. Because comets contain some of the most pristine materials in the Solar System, they offer a natural laboratory for investigating whether or not these larger chunks could have remained magnetised. However, detecting the magnetic field of comets has proven difficult in previous missions, which have typically made rapid flybys, relatively far from comet nuclei. It has taken the proximity of ESA’s Rosetta orbiter to Comet 67P/Churyumov-Gerasimenko, and the measurements made much closer to and at the surface by its lander Philae, to provide the first detailed investigation of the magnetic properties of a comet nucleus. 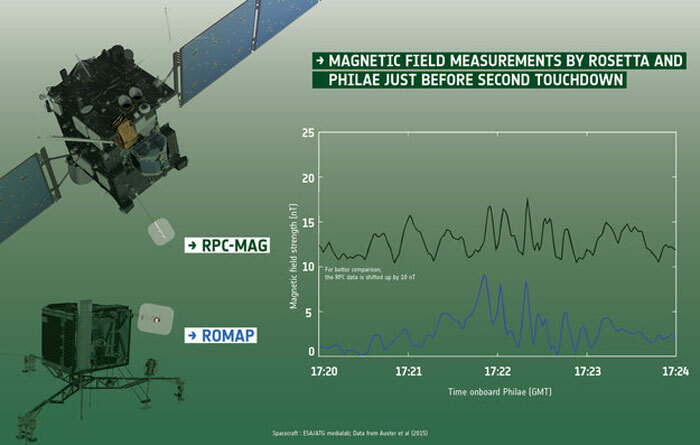 Changes in the magnetic field surrounding Rosetta allowed RPC-MAG to detect the moment when Philae was deployed in the morning of 12 November 2014. Then, by sensing periodic variations in the measured external magnetic field and motions in its boom arm, ROMAP was able to detect the touchdown events and determine the orientation of Philae over the following hours. 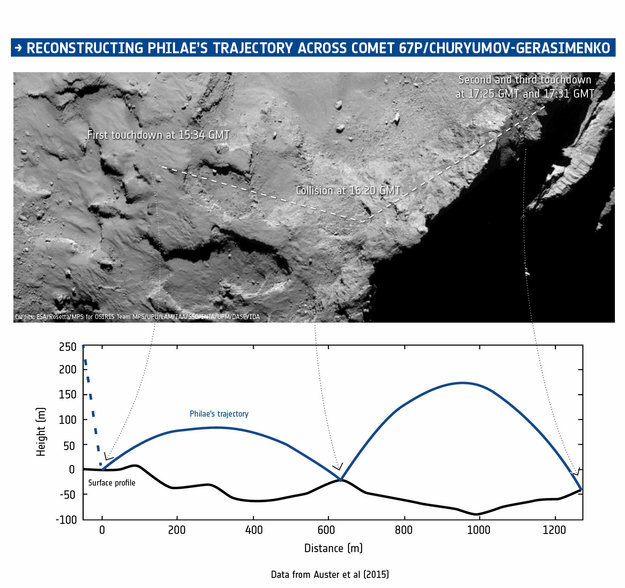 Combined with information from the CONSERT experiment that provided an estimate of the final landing site location, timing information, images from Rosetta’s OSIRIS camera, assumptions about the gravity of the comet, and measurements of its shape, it was possible to determine Philae’s trajectory. The mission teams soon discovered that Philae not only touched down once at Agilkia, but also came into contact with the comet’s surface four times in fact – including a grazing collision with a surface feature that sent it tumbling towards the final touchdown point at Abydos. This complex trajectory turned out to be scientifically beneficial to the ROMAP team. “The unplanned flight across the surface actually meant we could collect precise magnetic field measurements with Philae at the four points we made contact with, and at a range of heights above the surface,” says Hans-Ulrich Auster, co-principal investigator of ROMAP and lead author of the results published in the journal Science and presented at the European Geosciences Union General Assembly in Vienna, Austria, today. The multiple descents and ascents meant that the team could compare measurements made on the inward and outward journeys to and from each contact point, and as it flew across the surface. Instead, the magnetic field that was measured was consistent with an external one, namely the influence of the solar wind interplanetary magnetic field near the comet nucleus. This conclusion is confirmed by the fact that variations in the field that were measured by Philae closely agree with those seen at the same time by Rosetta. 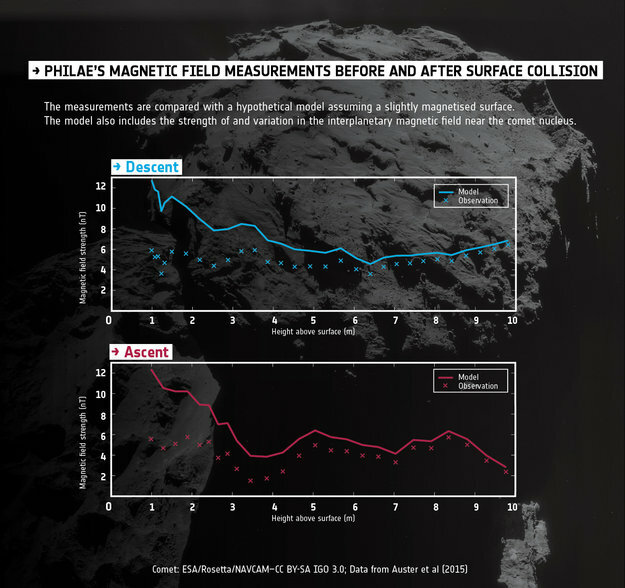 “During Philae’s landing, Rosetta was about 17 km above the surface, and we could provide complementary magnetic field readings that rule out any local magnetic anomalies in the comet’s surface materials,” says Karl-Heinz Glassmeier, principal investigator of RPC-MAG on board the orbiter and a co-author of the Science paper. If large chunks of material on the surface of 67P/Churyumov-Gerasimenko were magnetised, ROMAP would have recorded additional variations in its signal as Philae flew over them. “If any material is magnetised, it must be on a scale of less than one metre, below the spatial resolution of our measurements. And if Comet 67P/Churyumov-Gerasimenko is representative of all cometary nuclei, then we suggest that magnetic forces are unlikely to have played a role in the accumulation of planetary building blocks greater than one metre in size,” concludes Hans-Ulrich. “It’s great to see the complementary nature of Rosetta and Philae’s measurements, working together to answer this simple, but important ‘yes-no’ question as to whether the comet is magnetised,” says Matt Taylor, ESA’s Rosetta project scientist. Today’s CometWatch entry was taken by Rosetta’s Navigation camera on 12 April from a distance of 146.8 km from the centre of Comet 67P/Churyumov-Gerasimenko. The image scale is 13m/pixel and has been processed to bring out the details of the comet's activity. It is cropped to 10.3 km (the original frame, provided at the end of the post, measures 13 km across). In this orientation the comet’s small lobe is to the left and the large lobe is to the right. The large lobe includes an oblique view across Imhotep. The raised section on the top left side of the large lobe is at the boundary of Aten and Babi. This post is based on an article published on the NASA JPL Rosetta science blog. 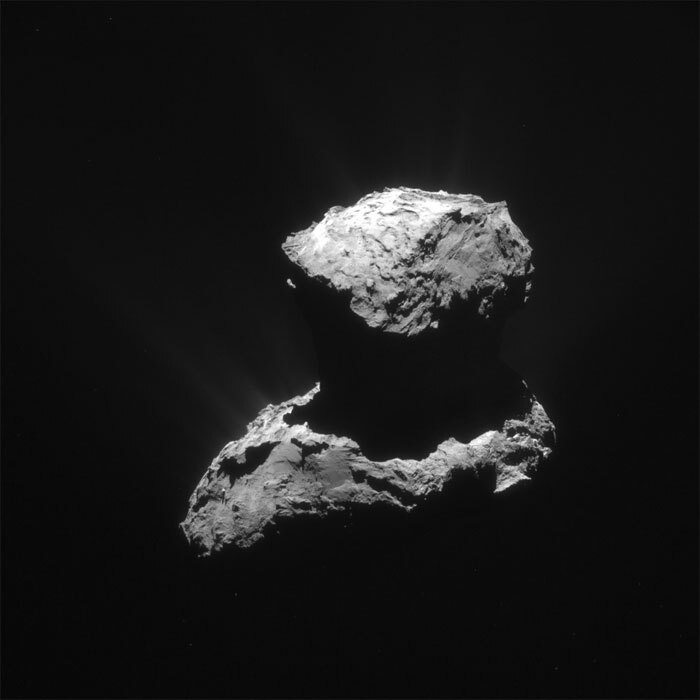 Comet 67P/Churyumov-Gerasimenko is back! In fact, the comet has been in sight for Rosetta for many months, but since the end of last year it was not possible to observe it with telescopes on Earth because it was in solar conjunction. But now the comet has been recovered by amateur astronomers Jean-Francois Soulier, Jean-Gabriel Bosch and Alain Maury, who observed it from Chile on 13 April 2015 at a magnitude of of 16.8. Congratulations to the observers! Padma A. Yanamandra-Fisher, Rosetta Coordinator of the Amateur Observations for Comet 67P/Churyumov-Gerasimenko, would like to alert the amateur astronomer community that 67P/C-G has now been recovered post-solar conjunction and invite them to participate in the campaign to observe the comet from April to December 2015, as Rosetta accompanies the comet to its perihelion and outbound journey. Amateur astronomers will be able to make significant contributions to the campaign, especially in 2015, leading up to perihelion in August and beyond, when the comet will be at its brightest (September – November). They can contribute in many formats, ranging from imaging, spectroscopic and binocular observations to sketches. Amateur astronomers who wish to join the campaign can register here and on the corresponding Facebook group. For additional information, read the article on the NASA JPL Rosetta page here or contact Padma Yanamandra-Fisher. Rosetta’s dust analysing instrument COSIMA (COmetary Secondary Ion Mass Analyser) has been very busy collecting dust – 12,000 grains and counting! The COSIMA team shared this image of some of their named dust grains at the European Geosciences Union General Assembly in Vienna this week. 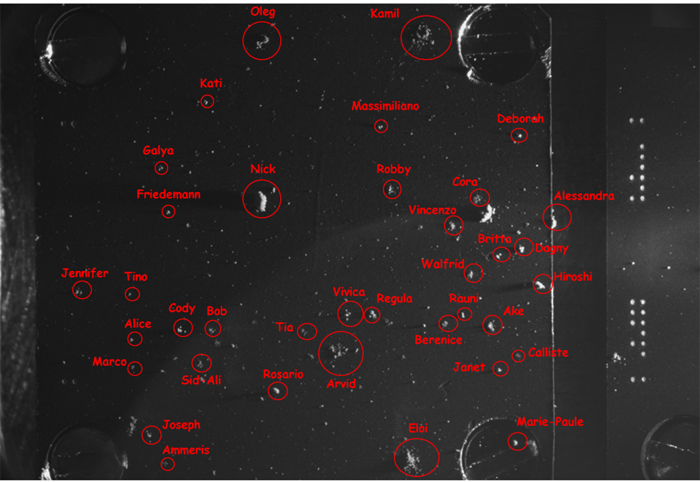 Meet more COSIMA dust grains! The target plate measures 1cm across, and shows dust grains collected between 11 August and 12 December 2014. Credits: ESA/Rosetta/MPS for COSIMA Team MPS/CSNSM/UNIBW/TUORLA/IWF/IAS/ESA/BUW/MPE/LPC2E/LCM/FMI/UTU/LISA/UOFC/vH&S. The 12,000 grains were collected between 11 August 2014 and 28 March 2015, on nine target plates measuring one square centimetre each. The image presented here represents one of these targets, and shows grains collected up to 12 December 2014. COSIMA studies dust in situ by capturing grains on small target plates like this one, first imaging these with an optical microscope and then analysing the composition of selected grains using a secondary ion mass spectrometer. COSIMA has 74 target plates in total and the instrument is designed to investigate dust grains larger than about 10 microns.